irmp3_monitor: a GTK+/GNOME interface as seen in the screenshot above. 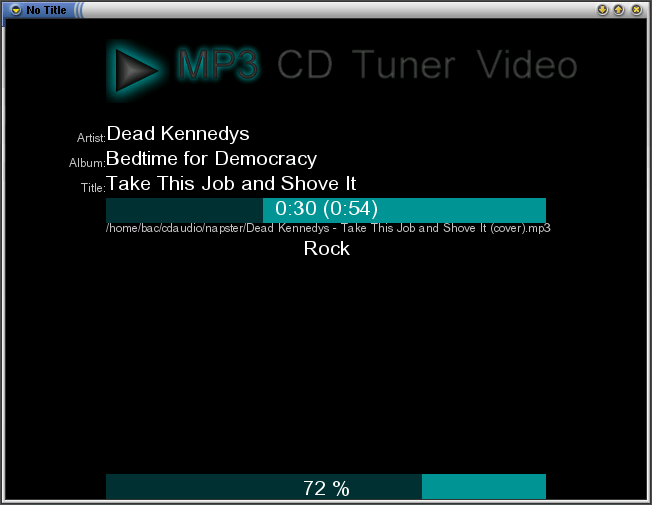 irmp3_monitor displays the current song information and volume information as obtained from IRMP3. There is also a pop-up menu to do simple control actions. irmp3_sdl_monitor: A similar SDL interface meant to be used as a front end in an entertainment center. This client is inspired by bosdl used by bossogg. It's currently in a very raw state, but it does function. You will need SDL and SDL_ttf to make irmp3_sdl_monitor. GTK+, GNOME, and libglade are required for irmp3_monitor. Use the standard "./configure" and make. make install is not supported (yet). Disclaimer: All of the above is purely my fault. The views here are not necessarily the views of my employer or myself for that matter.